Klaasend, I have been gone so long I don't know how to PM you - have something I would like to send you on this case. I see Klaasend has replied to your post BlueBob, but I wanted to say "Hi" and it's good to see you. she doesn't know who called or why. Thanks Trimm. I'm glad you found it. because I couldn't. Hmmm...that is interesting that this Megan received a call from one of the cellphones. I wonder if her number is just similar to someone that the Irwin family knows...or if someone that knows Megan kidnapped Lisa? Wow so many questions. 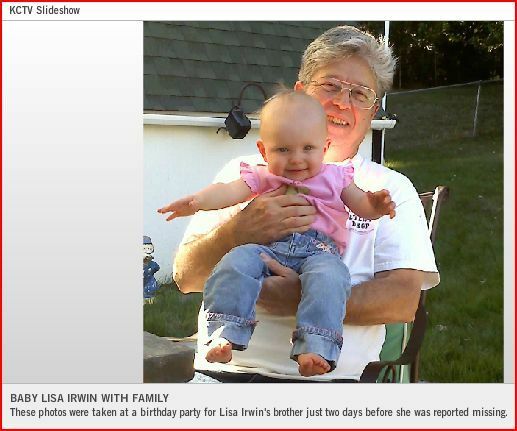 KCPD: #LisaIrwin family atty cancels re-interviews w Lisa's brothers & JohnWalsh of @1800CRIMETV this am @TodayShow. ABC News reported on Friday morning that Short was forced off the case overnight. No other details were released. News of Short's firing came hours after Joe Tacopina, the New York attorney representing Deborah Bradley and Jeremy Irwin, abruptly canceled an interview that was supposed to take place with baby Lisa's siblings. The two boys were scheduled to be interviewed by a child expert on Friday. 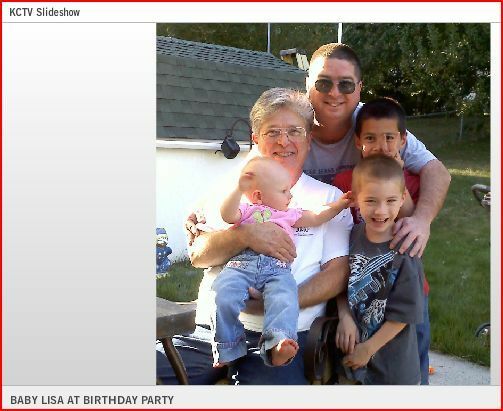 Deborah Bradley has said the boys were inside the home the night baby Lisa disappeared. Hmmm.. 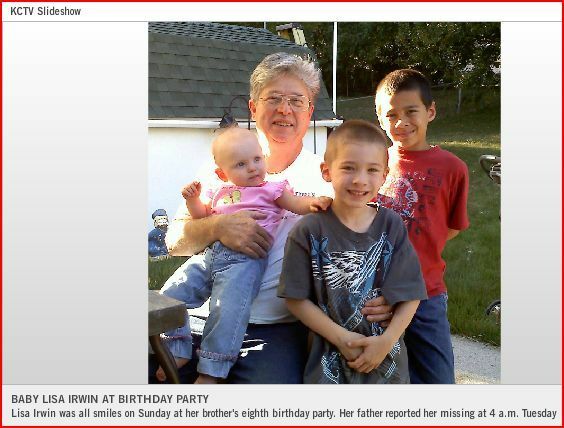 I thought the cell phones were not working due to non payment..
KANSAS CITY, Missouri (CNN) -- Attorneys for the family of a missing Missouri toddler canceled a Friday interview between the police and her two older brothers, who were in the house the night she disappeared, authorities said. The "nonconfrontational" re-interview Friday would have been conducted by a child services specialist without a police officer in the room, Young said. "(It's) not an interrogation," he said. "They are kids, after all." It was unclear whether the attorneys will reschedule the boys' interviews. Police also said they are seeking tests on the boys in order to eliminate them from all the DNA found in the home during a police search. A cadaver dog searching the family's Kansas City home indicated a positive "hit" for the scent of a body, police said. On that information, Short said law enforcement typically begins such investigations inside the home then, if warranted, the probe moves outside the family. "We don't know exactly what happened here, so we need to keep broadening the investigation," she said. Between 30 and 50 investigators, including police and FBI personnel, were involved in the search as of Tuesday, the Kansas City Police Department said. Some 900 tips had been received by investigators, the department said. YW Curious to see what might come from this. KANSAS CITY, Mo. -- ABC News is reporting that Kansas City attorney Cyndy Short is no longer representing the parents of missing 11-month-old Lisa Irwin. Tacopina said he would call police next week and reschedule the interview. Well, well, well. Now I'm wondering if we're ever going to know what happened to Lisa. One name: Joe Tacopina. Thank you Red. Sadly I agree with you on all points. Debbie Bradley and Jeremy Irwin have canceled plans for a trained specialist to interview their two sons about the disappearance of their missing daughter. The 5- and 8-year-old half brothers were scheduled to be interviewed for a second time Friday. The specialist was also to take DNA samples from the boys. But Kansas City police said about 10 p.m. Thursday that those interviews were off at the request of Joe Tacopina, the New York attorney who is representing Bradley and Irwin. Darin Snapp, spokesman for the Kansas City Police Department, said that Tacopina did not give a reason. Tacopina indicated that the interviews would be rescheduled for next week and police hope that occurs, Snapp said. Police have said they needed the two boys to answer questions about what they saw and heard in the hours in which their sister went missing from her Northland home more than three weeks ago. Police had sought the boys' DNA in an effort to compare it against DNA collected from the home. The boys were initially interviewed by a trained specialist in the hours immediately after their sister went missing and an Amber Alert was in place for the Kansas City area. The cancellation of the interviews comes the same day that the Kansas City area attorney for the couple called off a news conference and a tour of their home. Kansas City police also helped lead a two-hour search of a nearby pond Thursday, but turned up nothing. Ditto. There is something horribly wrong with this picture. The cell phone issue has always bothered me. What a bizarre detail...3 cell phones taken, along with the baby? Wine box drunkie Mom? Let's hope the cancellation of interviews, lawyer firing, means that LE has something tangible. Yes Jerseygirl...you are right. I didn't even think about that. WoW! This stuff makes NO sense. Surely they don't have people that they know but aren't close trying to set up a defense for them. Or...are there really people out there trying to insert themselves into this circus? 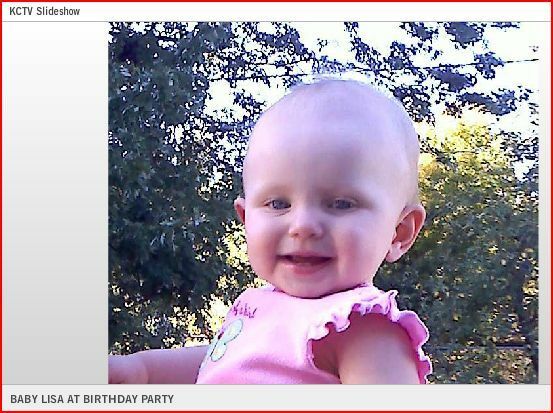 I went and looked again at the pictures of baby Lisa that was taken two days before her disapearance at her step brothers 8th birthday party and I wish I knew how to post them here in the forum because it shows her alot better as far as her weight and stuff but sadly I dont know how to do that.....Anyway, God Bless baby Lisa wherever she is! !